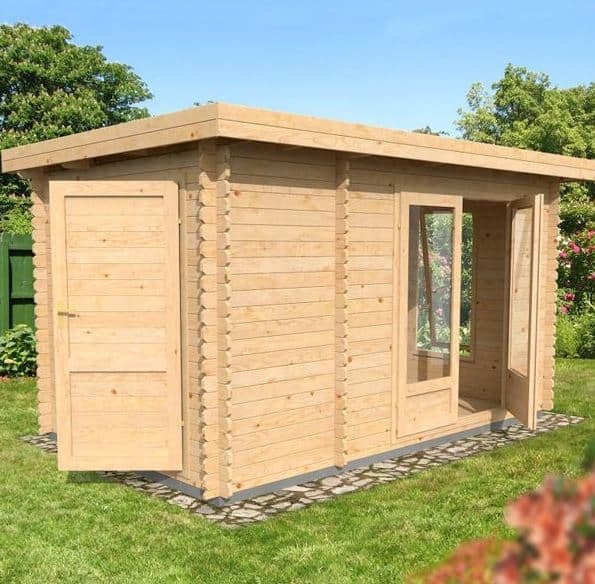 This great log cabin is part of the Waltons Zen range and it offers plenty of fantastic features. It is one of the more compact cabins available and can be used for a wide variety of purposes. Turn it into a home office, an additional living room, a games room or a home gym – the choice really is yours. 19mm tongue and groove construction is used for the roof and the floor. This highlights the cabins quality; ensuring you can store absolutely anything in here without having to worry about whether it will withstand the weight. What we really like is the fact you can upgrade the cladding thickness of the exterior walls. As standard, it comes with 28mm thick tongue and groove cladding. However, 34mm and 44mm upgrades are available for an extra cost. One of the more unique features of this cabin is the 3 door access. There’s the attractive glazed double doors to the front of the building, then at the side there’s a wooden single door that can be used for quick and easy access. It also comes with an unusual flat roof, though it does feature a slight gradient to help with water resistance. It’s a unique and beautiful building that will fit into most gardens. 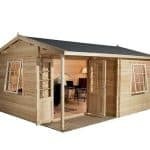 This is considered a large summerhouse, though compared to a lot of other log cabins, it is actually pretty compact. Part of the Zen range, the Zen 2 is almost identical to the Zen 1, only it doesn’t come with a veranda. 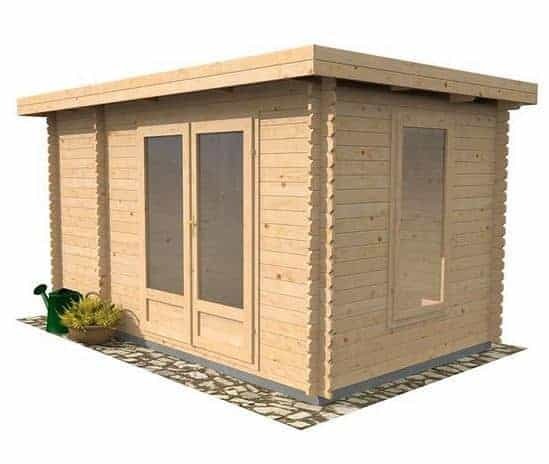 It is a strong cabin that can be used for many different things. Its versatility is one of its leading benefits and it offers a generous amount of space to work or relax in. There is also a separate side storage area which is one of its more unique features. Not many log cabins feature a dedicated storage space where you can safely store gardening essentials. 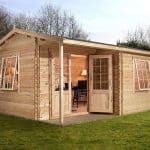 So if you’re looking for both the benefits of a shed and an additional living or working space, this is one of the best cabins to choose. You will appreciate the width of the doors, especially if you are going to be adding furniture or bulky gym equipment. They have a wider design than standard doors and open out to reveal instant easy access to the building. The roof height is also great, offering a comfortable amount of head height so that you can walk around with ease. 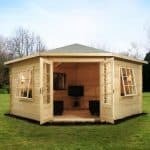 The depth is very compact compared to most log cabins which makes it more suitable to medium size gardens. If you’re looking for a cabin that won’t take up too much external space but offers comfortable and easy access then the Zen 2 is the perfect choice. A distinguishing feature of the Zen range is the flat roof. It’s extremely unusual to find this type of roof on outdoor buildings and it may leave you wondering how water resistant it actually is. As it doesn’t have the same capabilities at directing rainwater away from the building like a pent or apex roof, Waltons have added a slight gradient which prevents the water collecting on top of the building. You can see that the roof has quite a thick design, which is thanks to the 19mm tongue and groove. It also has an overhang which is supported by really strong joists. A heavy duty roofing felt is also supplied and it is created from minerals. The only bad thing about this is whilst it will offer great protection in the short term, the felt isn’t likely to last for longer than 1-2 years depending upon the weather. So we would recommend taking advantage of the superior felt offered as an extra. The floor of this cabin has been constructed with 19mm tongue and groove too. This means it is moisture resistant and it can hold heavy desks, equipment and furniture. It also makes the floor more solid to walk over, giving you peace of mind about its stability. The standard version of this cabin comes with thick 28mm timber log cladding. 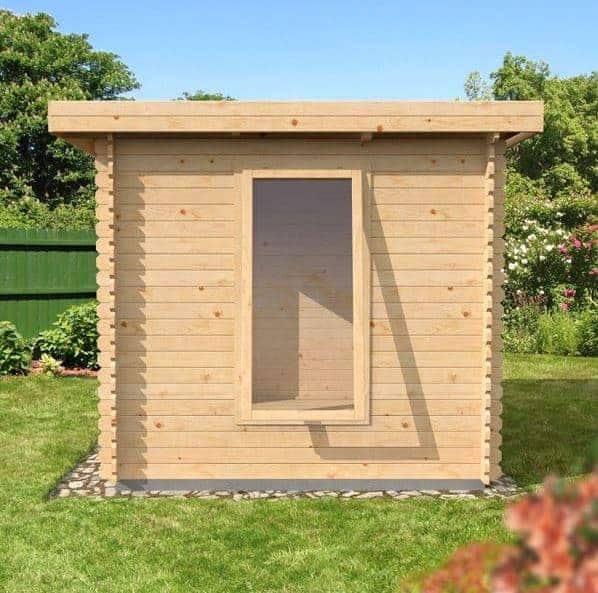 The softwood pine construction doesn’t just offer benefits in terms of thickness, it also gives the cabin a beautiful appearance. It fits together with a tongue and groove design, forming a solid and tight waterproof barrier. There are no gaps in this cladding apart from the expansion gap. This is there to prevent any issues from cropping up if the timber warps due to seasonal temperature or moisture changes. The risk of this happening is low, but it’s still good to have that protection there just in case. Now you can stick with the 28mm cladding and it will last looking as good as new for a long time. However, if you want to make the cabin as comfortable and as weatherproof as possible, you also have two upgrade options. The first is a 34mm cladding. Mainly recommended for adding extra insulation into the building, it also really helps to improve its rigidity. The 44mm upgrade however comes with a little something extra. Not only is it ultra-thick, but it also comes with an incorporated double wind tunnel. This isn’t found on many outdoor buildings and it provides an incredible wind-proof barrier. So the risk of feeling any drafts, no matter how windy it becomes outside, is minimal. Of course the thickest cladding will also add the most stability. It makes the cabin’s walls thief-proof as well as weatherproof. Ultra-thick cladding needs an ultra-thick frame. So it’s good to see Waltons have taken this into account and added double framed corners. It isn’t just the width of the frame that is worth mentioning. It also comes with a smooth, planed and rounded design. So like the exterior of the cabin, the interior also boasts an attractive design. 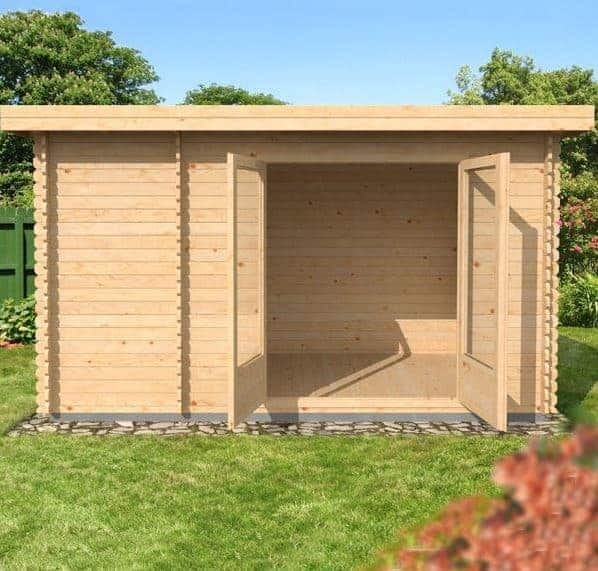 A 10 year warranty is supplied with the cabin, protecting it against rot and decay. Despite its rigid, very thick walls, it does still require treatment. As this is clearly a pretty large building, this may concern you. However, the good news is, if you use the right treatment you won’t have to apply it annually. To minimise re application time, use a spirit treatment. Once applied, it works down into the logs and forms a barrier on the inside and the surface of the timber. If you make sure to use a high quality treatment, this will fight off even the harshest elements and protect the cabin for up to two to three years. We would recommend missing no more than a year’s treatment however; especially if you are spending money on upgrading to the 44mm cladding. It may be a lot thicker, but the softwood will still deteriorate in harsh conditions if it isn’t treated. So obviously if you’re spending such a huge amount of money on the building, it makes sense to make sure it lasts as long as possible. This cabin offers wide, glazed double doors on the front and a single solid wooden door on the side. What isn’t made overly obvious on the pictures of the cabin, is that this side door actually leads into a separate part of the building. The separate storage area at the is closed off from the rest of the cabin and can only be entered via the side door. All of the doors are secured so you won’t need to worry about the cabin getting broken into. The specifications supplied by Waltons are actually incorrect. It states there are two windows included. However, there is just one located on the side of the cabin. The double doors are glazed too so this does ensure there is still plenty of lighting. However, the third door on the opposite side of the building takes up space where another window would be. The large, tall window supplied is single glazed, though you can upgrade to double glazing. You can find out more in the customisation options section of this review. If you do opt for double glazing, the glazing on the doors will also be upgraded. You can also open the window to allow additional air inside the cabin. The solid build of the cabin provides a naturally secure design. Even the standard 28mm cladding will prove almost impossible to break into. The doors are lockable, as is the window. So you won’t need to worry about thieves gaining easy access. If you do stick with single glazing however, it won’t be that hard to smash through. So this is something you need to think about when trying to decide whether or not to upgrade. Even though the double doors feature large glazing and there’s a tall window on the side of the building, it still offers some privacy. One side of the cabin is windowless and so it is possible to work privately if you place a desk at the more covered part of the building. You can also add curtains which would actually make a really nice, cosy touch. Log cabins don’t tend to be very private anyway, but this is definitely one of the more private buildings on offer. Whilst the main cabin area itself isn’t completely private, the storage area is. So if you have valuable equipment you need to store away, you can be sure it won’t be seen. 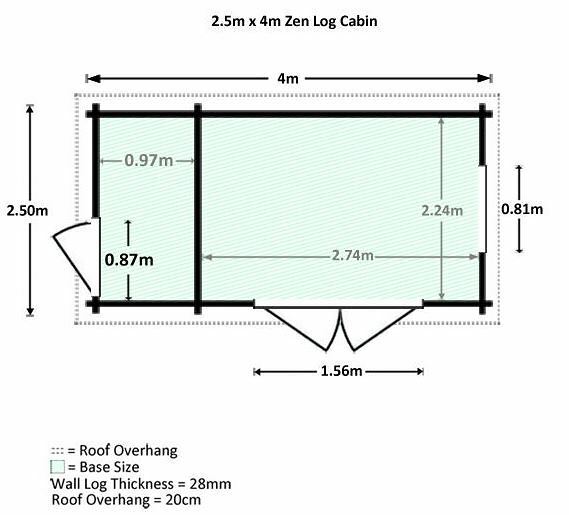 The Zen 2 cabin can be customised in three ways. You can upgrade the thickness of the cladding and the glazing, as well as the durability and style of the roof. All of these upgrade options aren’t cheap, but they do provide a few excellent long-term benefits. The cladding is responsible for keeping the interior dry and protected from the elements all year round. As it comes with 28mm thick cladding as standard, it already supplies a long lasting, weatherproof design. However, by upgrading to the thicker options you are essentially boosting its longevity, as well as its security and comfort. There are two upgrades available including 34mm and 44mm walls. What we should highlight is that the 44mm walls comes with an additional weatherproof benefit in the form of a double wind channel. This really helps to improve the cabins insulation, preventing drafts no matter how windy it gets. The 34mm cladding doesn’t have the double wind channel, though it will still obviously help to naturally boost the cabins insulation. Single glazing measuring 4mm thick is included in the Zen 2 and this does offer a good amount of both insulation and noise reduction. However, we would recommend upgrading to the 16mm double glazing if you can afford it. This is one of the most affordable customisation options and it will be added to both the doors and the window. This makes quite a big difference to how warm the cabin is in winter and further reduces the levels of noise, making it especially ideal if you’re going to use it as a home office. It will also boost security as the thick glass will be very hard to break. The last customisation option is the type of roof covering you prefer. Waltons offer superior duty felt and Armourshield shingles. The latter is what we would typically recommend. However, as the roof of the Zen 2 is flat, we think you’d benefit more from the superior duty felt. This is created with fibreglass and unlike the heavy duty felt supplied, won’t perish in harsh weather. It has a thick design and offers a fantastic level of water resistance. It does come in two different colour options, but really it doesn’t matter which you choose as you won’t be able to actually see it. That’s why on this rare occasion we don’t recommend the shingles. They do provide a fantastic amount of weatherproof protection, but they are mainly used for their decorative appeal. As you won’t see them it would be a waste of money using them on this cabin. As well as the three customisation options, the Zen 2 also gives you 3 optional extras. The good news is, these aren’t essential so if you’re hoping to save money, you don’t need these extras. However, a couple of them are worth thinking about. The most expensive extra is the solar panels. Before deciding whether or not to invest in these kits, you need to consider how you want to use the cabin. Are you likely to use it at night time? If so you will need a source of light. Will you need to use power tools, appliances or electrical equipment? If so, you will need a power source. The most common way to get both light and power into an outdoor building is to buy an electrical kit which is connected to the mains. However, the trouble with these kits is that they are hard to install and they also come with long-term running costs. Solar panels on the other hand use renewable energy, aren’t connected to the mains and will not cost anything after the initial purchase cost. Waltons offer five solar panel kits. They range in both power and cost. Some are also free standing, whilst others are roof mounted. If you are wanting to power more than one appliance at the same time, you will need one of the more powerful solar panels. Obviously the more powerful the panels, the more expensive they will be. Garden Building Insulation kits are also available, though we do feel if you invest in the thicker cladding, these aren’t really needed. They will help to make the cabin a lot warmer in winter and eliminate drafts all year round. 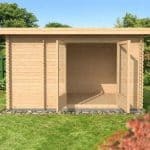 However, for the additional cost, we’d only recommend them if you’re sticking with the 28mm cladding or if you have a large budget available to spend on the building. The last extra available is the Waltons installation service. 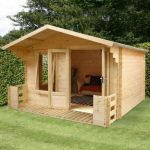 As this is a smaller cabin and it doesn’t really have any complicated features, if you’re good at DIY we would advise building it yourself. However, if you have the cash and you want to save a lot of stress as well as time, then this would be a very useful extra. 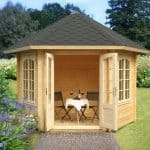 As even the roof and floor comes with tongue and groove cladding, the quality of this cabin is excellent. Just sticking with the 28mm cladding still gives you a thick, strong and very sturdy building. As treatments are needed to maintain a good weather resistant design, we can’t give this full ratings. Although, thanks to the cladding thickness and the superb 19mm thick floor, this is guaranteed to last for a minimum of 10 years. 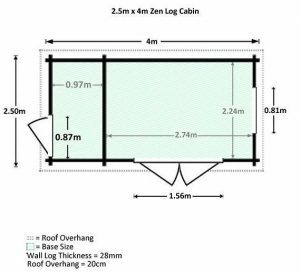 A lot of log cabins are huge, but the Zen 2 comes with a fairly small size in comparison. However, that doesn’t mean you don’t get a lot of storage space. You could fit a sofa in here or several pieces of gym equipment. It’s more a cosy cabin than a large, spacious one however. What we do love is that there is a completely separate storage area included in the cabins design. So you have space to just relax or work and then a separate space to store any gardening tools you may have. 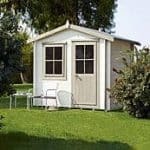 One of the main benefits of having a compact size is that this cabin is easier to install than a lot of competing cabins. Walton’s always supply good quality, easy to read instructions. However, the cladding thickness will definitely make a difference to how quickly you install it. The 44mm option will be significantly heavier than the standard 28mm cladding. So you need to keep this in mind. Though like all cabins this one comes at a fairly high cost, overall its value for money is incredible. It’s guaranteed to last and is constructed with the finest materials. It also has quite an unusual design which will make it a stand out feature in the garden.